« Is there a Proximal LAD equivalent ? April fooled with PTMC balloon ! PTMC is a revolutionary interventional cardiology procedure .A fibrosed obstructed mitral valve is opened up just like that , with few wires and a balloon .The procedure performed within 30 minutes .No anaesthesia . No surgery .No scar. Thousands of procedures are done world-wide (Rich countries excluded they do not have RHD) .We in our institute , have gained considerable experience in PTMC , and have completed nearly 200 procedures in the last few years . As we gain experience surprises also galore ! .Suddenly I realised this funny (At least for me !) 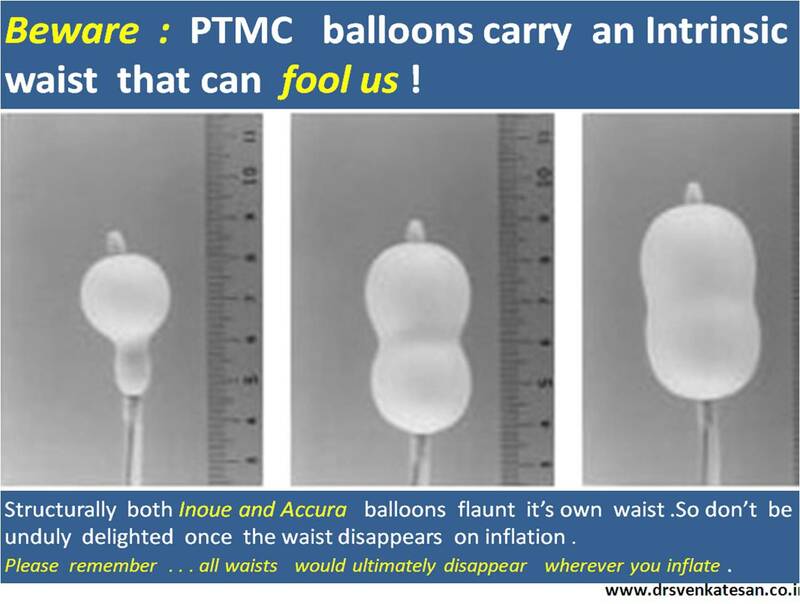 phenomenon from the unique PTMC balloon design. The other day , there was an intense argument between two of my fellows , who were in a dispute .One was arguing , the PTMC balloon had dilated the tricuspid valve erroneously while other was adamant , and wholesomely convinced , since the waist had disappeared it must be the stenotic mitral valve. The issue came to me . . . ended after a nice debate ! Both PTMC balloons (Inoue ,Accura) are made with innovative design conceptualized by Japanese genius Kanji Inoue . The balloon has two layers of latex with a nylon mesh sandwiched in between.The latex is compliant while nylon limits it and generates the required pressure . The balloon is glued in a such a way , central part is constricted like narrow band .This makes sure the distal part of balloon inflates first , followed by the proximal and finally the central .This also help us to geographically to fix the balloon across the narrow mitral valve orifice . While , we must agree this a great concept , there is an an inherent issue when handling a hour glass shaped balloon with a natural waist .There would be great deal of confusion when we take disappearing waist as an index of relief of mitral stenosis. Please realise , falling pressure gradients and echo documentation of MVO rules supreme in assessing successful PTMC. Often times , disappearing waist is meagerly an optical Illusion or gratification.